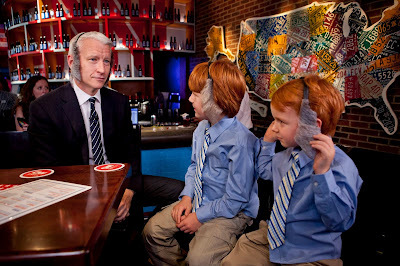 Blogger's note: For those who noticed AC360 was not live tonight, Anderson stated in his interview with Good Day New York this morning (see video in extras), that he was headed to LA for 60 Minutes this weekend. Perhaps he taped a little early and caught a flight out tonight? I liked the first half of AC360 tonight, but found the second half kind of a train wreck. First off, I found it odd that none of the top 5 "What Keeps You Up At Night" concerns were health care. I've found that to be a big concern for most people and it is related to the economy whether some want to admit it or not. The follow up with John King seemed like a chance to say POTUS won't/can't win. Seems they don't like the current numbers, so they had to look at historical data to bash the President tonight. I like Gary Tuchman, but don't really care for these crime and punishment segments that are so locally centered. Just seems like filler to me when there is so much news happening in the world. Thanks for the Ellen clip - loved Anderson with those kids! I did not watch 360 tonite, however, according to USA Today, in their new format, Obama now has a substantial lead over Mitt Romney and it is getting wider as Mitt shows his ignorance on most issues. If his idea of a platform, is attack, with no substance behind the attack, Mitt is sure to lose. People do not like attack adds and his nine year old VP candidate better start telling the truth. Along with attack your opponent at whatever cost, someone must tell this child wonder that telling fibs is not a grown up thing to do. the week that cost Mitt Romney the election...showing his ignorance in foreign affairs. President Obama has learned how to handle himself with diplomacy and smarts when it comes to foreign affairs. If Anderson was on Good Day NY, it was purely to promote his show. He must have been told about his ratings, or lack there of. Of course the big story is still the Americans killed in Libya and the turmoil in the Mideast. The best segment was Anderson fact-checking statements/tweets by Amb. Williamson and Paul Ryan. The panel discussion with Rich Galen and Paul Begala was especially smart and well-done by both men. I'll have to double-check the transcript but does anyone here remember who Begala was talking about when he mentioned a "chest hair toupee"? Elsewhere on the internet I read an excellent description of Romney - he's like a mannequin in a store window, looks fine from a distance but you get close and you notice the eyes have been painted on. The best 'What Keeps You Up At Night' was Tuesday's - ordinary small business owner stated what taxes were doing to his business and then the expert panel discussed. Thursday's was a short piece on David Walker about the deficit. The whole thing looked like a high-school production YouTube video simply advertising the guy's seminar. Friday's about unemployment had another poorly produced video featuring some expert. If these are the issues keeping ordinary American's up at night, why not feature an ordinary American stating their point of view and then have the expert panel? This series started out well but just ended up in the ditch. I'm glad the contempt of court charges were dropped against that teenage girl. Damn right the boys should get a harsher sentencing. @Anon 11:22 pm - totally agree that health care should have been one of the issues in 'WKYUAN'. @anon 11:22 pm, I got the exact same impression as you about the segment with John King. Of course, much can change in the next month or so, but as anon 11:45 says, most polls show President Obama leading Romney nationally--it does sometimes seem that John King, Anderson and others at CNN like to throw water on whatever positive news there is for President Obama, but it was refreshing on Thursday night when David Gergen and Gloria Borger had no choice but to admit that things weren't going so well for old Mittens--Gergen even called his campaign "inept" and that's becoming more noticeable day by day. I don't think he can be trusted to think things out carefully before he makes decisions--plus it doesn't help that he's being guided by too many folks from the Bush Administration on foreign policy and we all know what a disaster that was. I didn't watch 360 once I saw it was taped. I just don't care for taped, old news. 360 is always behind on stories. The piece on the girl being raped and tweeting who did it is a really old story. As to the election race. As I said I didn't watch but if Anderson and gang backtracked and were trying to change what they said Thursday night, well that is because the poll they used Thursday night was found to be too skewed to be believed. It polled 38% Dems and only 21% Reps. You can't get a fair poll when there is that big of a difference in who is polled. The most used, nonpartisan and revered poll is Rasmussen. Then Gallup comes in second. Rasmussen has Romney leading and gallup has Obama ahead. Basically it is still a dead tie and no one has pulled ahead from the other. You can't trust a poll that is done by anyone that has any political leanings. They always try to stack the deck for their side, which is what happened with the poll they used Thursday night and are now trying to back away from. This election is far from over! No one has the upper hand. And we shall see how the unrest and Embassy attacks bode for Pres Obama in the polls next week. Someone said Anderson taped a segment for the talk show with his mom and Kathy Griffin yesterday. Perhaps he was out doing things with them last night and that's why he taped 360. The talk show will be taped Monday not live. He taped the Emma interview this week, Wed. or Thursday, can't remember. But that probably means he will still be in LA Monday, so I take that to mean he did not leave last night for LA but will leave today and be in LA still doing his 60 Minutes thing Monday. Will he be on 360 is what I'm wondering?